Capt. Gerard Petroni was the picture of health — lean, muscular, and more active and athletic than some men half his age. He and his family enjoyed an active, outdoor, adventure-filled life. But on the inside, unchecked and undiagnosed, high blood pressure was wreaking havoc on his body. It came to a head on Thanksgiving in 2006, when he suffered a massive stroke. Six months later, still unable to walk, eat or speak, Capt. Petroni was given a pen and a piece of paper and asked if he could write - anything he wanted to convey. He pressed his hand to the paper and wrote the words: "Never quit." Almost nine years later, Capt. Petroni's family has turned those two words into a worldwide movement aimed at increasing awareness of the risk factors of high blood pressure through an annual event called, you guessed it, "Never Quit." The event features free blood pressure checks, a 5K run, and a host of "fun and healthy activities," including a 1-mile "fun run," sunrise yoga, skydiving demonstrations, and for serious gluttons for punishment, a "Battle for the Beach" and "Warrior Challenge" competition. This year's event is being held Saturday, June 6, in Jacksonville Beach, Florida. It will again feature one of its driving forces, William Freeman, M.D., the neurologist at Mayo Clinic's Florida campus who first treated Capt. Petroni after his stroke. Although Capt. Petroni's MRI showed "lots of damage from chronic unchecked high blood pressure," Dr. Freeman and colleagues were able to place a catheter to relieve the pressure on his brain and use a clot-busting drug to dissolve the clot That treatment gave the captain three more years with friends and family before a second stroke took his life in 2009. Ever since, Dr. Freeman has been helping the family "pay it forward" by using Capt. Petroni's legacy to teach others about the importance of monitoring their blood pressure. Their hope is that others get tested, diagnosed and treated. The Never Quit event is about public awareness and is very personal, Dr. Freeman says. "Capt. Petroni was my patient. I cared for him over several years before he died. Over time, the family and I became close, and they are like extended family to me. It's a touching and moving story that I am honored to be a part of with them." Learn more about Capt. Gerard Petroni on the Never Quit website. 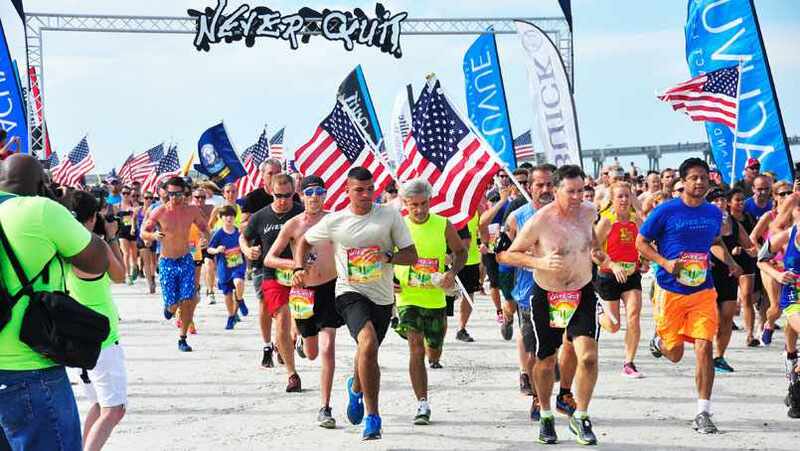 And for more on this year's "Never Quit" event, visit neverquitnever.com. Then, be sure not to quit on us by taking a moment to share your comments below and share this story with others using the social media tools atop this page.